Fluoroscopy uses a continuous low-dose X-ray beam to produce images of organs and bones in real time, on a television monitor or screen, like an X-ray movie. During this procedure, radiologists usually use contrast material (dye) to highlight the area being examined. The contrast material can be injected or taken orally or rectally, depending on the area being examined. Fluoroscopy is used for investigations of the gastrointestinal tract; (a barium enema for the colon is one example). It is also used during placement or manipulation of catheters, during urological and orthopedic interventions, and to assist in the implantation of cardiac devices. 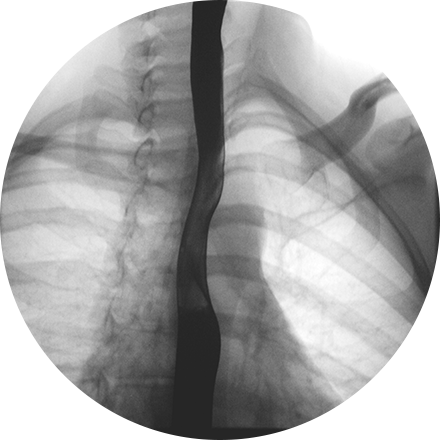 Fluoroscopy may also be used during an angiogram. What happens during a fluoroscopy procedure? The technologist will position you sitting, standing, or lying on the exam table and then conduct the procedure. You will be able to communicate with the technician during the procedure. You can leave immediately after your fluoroscopy procedure. Drink plenty of fluids, especially water, for the next 24 hours to help flush the contrast material from your body. Fluoroscopy is painless and non-invasive. Digital images and flat-panel detector systems reduce patient’s exposure to radiation during this procedure, and the amount of exposure depends on the particular type of fluoroscopy. Fluoroscopy helps diagnose diseases and guide clinicians during treatment, and we use the lowest acceptable exposure for the shortest time necessary in order to reduce your risk.